Seb is brilliant with computers and numbers but it’s like he moves through a haze when it comes to people. When his parents push him to attend the school dance, Seb’s world turns on its head. Unfamiliar sensations confuse Seb when one particular girl is physically near but he cannot read her unspoken signals. Guzzle, his only friend, confuses him further with advice on what girls want. Seb prefers to retreat to the more predictable world of computers but even this world is destabilised by Miss Adonia, the replacement computer teacher, who is the first to challenge him in class. As Seb adjusts to having girls for friends and Guzzle struggles with family upheaval, life doesn’t look likely to settle for either of them anytime soon. When Miss Adonia suggests Seb might have Asperger’s Syndrome the world begins to spiral. With internet hacking and cracking at the centre of this tale, there are more than a few twists. 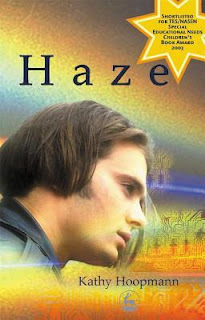 Haze not only drills into what it is like to have Asperger’s or a friend with Asperger’s, it explores family life and different types of betrayal. Haze is just as topical today as it was when it was first published in 2003. It will hold pride of place with my favourites.